​​FRISCO – Stream will build one of the first properties within the 216-acre master-planned development called Frisco Park 25. PowerSecure Lighting will anchor Stream’s 152,000-sf office development with a 76,000-sf lease for its North Texas corporate headquarters. Construction will begin later in 2017 and deliver mid-2018. 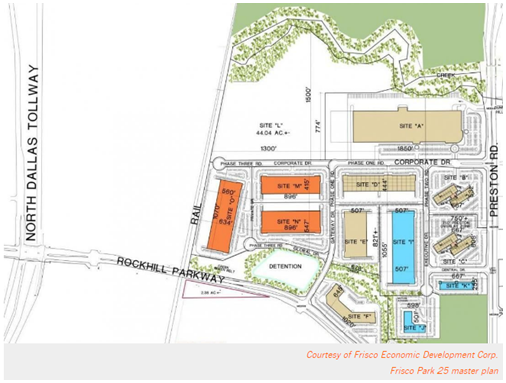 The Class A development was contracted for Site D from the Frisco Economic Development Corp. (FEDC). Frisco Park 25 has 14 lots on 216 acres zoned for industrial and commercial use. FEDC estimates the $300 million development at Preston Rd. and Rockhill Pkwy. will have 2.2 million sf at build-out. ​Want more ​data? See DFW Office Market Research.